Our women national record holder in the pole vault, 3.81m. Image courtesy of Rachel Yang. 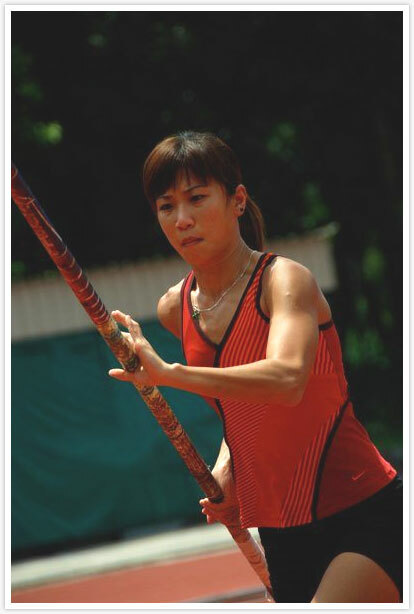 After her excellent record breaking feat this year in August, during the Pole Vault meet series, where Rachel Yang smashes her old national record of 3.75m to a new height of 3.81m, the 28-year-old was hoping her fine form would translate at the recent Thailand Open held last weekend. But it was not to be as the full-time tutor could only managed a height of 3.50m, which earned her a 4th place. Rachel spoke of her performance in Thailand, as “average”. Despite the dip in form, the Republic sole woman pole vaulter considers the outing as an excellent reminder to keep on training. Rachel Yang was quoted as, “It was a poor performance due to poor preparation 3 weeks leading to the competition. Training was dictated by fickle weather as we don’t have an indoor facility for pole vaulting – I had to miss 2-3 out of 4 technical sessions a week due to rain. In addition, I had to juggling with the crazy tuition schedule as exam is nearing. It was within my expectation to have an average performance. I was still disappointed but I knew what the problem was and I just had to move on and prepare for Asian Games (12-27 Nov).